CLEVELAND, Ohio – Paint and coatings producer Sherwin-Williams has published its tenth annual Colormix colour forecast, with a 42-colour palette divided into six themes, or what it calls colour journals: Shapeshifter, Wanderer, Aficionado, Enthusiast, Naturalist and Raconteur. They are described as fresh, fluid swipes of colour that are key for 2019 colour and design trends. Shapeshifter: There are those who always seem a little ahead of their time. Visionary and creative, this palette reaches into the cosmos and returns with a whole universe of inspiration. Shapeshifter’s aesthetic is about the mystical, from the deep sea to the galaxy and everything in between and is rooted by strong geometrics and clean lines. “The atmospheric wisps of colour, grounded by deep, mysterious blues capture the unique space between technology and spirituality found in the Shapeshifter palette,” said Wadden. Wanderer: This palette is for the person who will never be fenced in, who needs to soak in the endless horizons and subtle earthy tones of the high plains. Clays, caramels and browns come from canyons to worn leather and woven wool blankets of the true New West. Aficionado: Like a bookcase of leather-bound literary classics, this pedigreed palette evokes nostalgia and timeless traditions. Copper and gold anchor merlot and gray. The tailored tones are tasteful, elegant and classic. 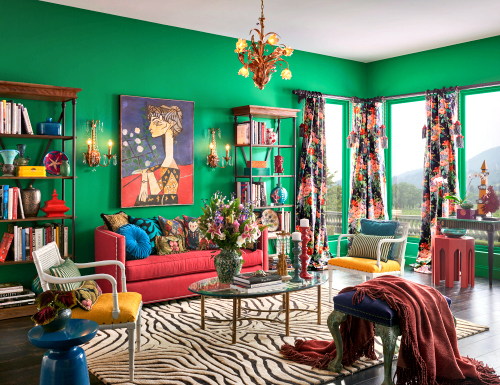 Enthusiast: For those who go against the grain, break the rules or are more free-spirited than the status quo, this palette brings maximum attitude and yet produces harmonious results while featuring bold pops of vivid blue, green and red. Naturalist: Nature lovers can connect with the wonder of the world in full bloom. This collection’s lush, sophisticated tones poke out from the rainforest as colorful tendrils. Ranging from mushroom to passionate pink, the focus on botanicals is slightly classic, with bold details. Raconteur: From ancient rhetoric to today’s on-screen webcasts, there is a desire and appreciation for stories and the storytellers behind them. From Africa to the New World, human origins have been translated into this rich palette that spans time. Sherwin-Williams provides greater detail about its 2019 colour forecast and other colour-related resources online at swcolorforecast.com. It has developed the ColorSnap Visualizer app to allow customers to use cutting-edge augmented reality to make faster and more confident colour selections. Furniture and home furnishings retailers should use the 2019 palette as a marketing and merchandising tool, Wadden told HGO.